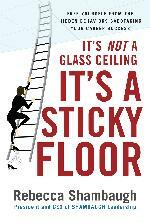 Rise Off the Sticky Floors"
More than one-third of Fortune 500 managers are women, yet they represent barely five percent of the top earners among executives. Usually the blame is placed on the �glass ceiling�, the �old boy� networks or �the club� that prevents access to opportunities. I believe the real obstacles to women�s advancement are self-imposed career blacks that prevent upward mobility, �sticky floors�. It all begins with our needing to create our own roadmaps to a chosen destination, based on values, beliefs and strengths � knowing your heart, mind and dreams. These are very challenging times and individuals and organizations need to do more than just tweak. We need to reset the dial and dramatically reframe for the future � including addressing the impediments to peak performance, and thus take charge of our own career advancement.